Ramble along a 150 metre, coastal trail from Portuairk and you will find Rudh Bubh, a restored black house, perched on a rocky outcrop above white sands. The cosy, secluded spot is a truly unique experience for the adventurous, the nature lover and those seeking remote beauty. Rudh Dubh is simply heaven on earth - thank you to its owners and to Steading for sharing it! In my opinion, Rudh Dubh is, without doubt, the most beautiful place on earth in. It provides a complete getaway from life's worries and stresses. I went there to start writing a new book. The only interruptions were that I couldn't stop staring at the beautiful changing skies, the seals playing in the water, the waves on stormy days, the clear blue sea in the sunshine ... the list goes on. Even the wind sounds different to the wind at home ... no buildings for it to work its way around ... it sounds like it's singing through the heather and across the mountains. The little house was very clean and cosy. Although it's simple, it has all the modern conveniences needed. I don't count WIFI/TV as a necessity and I didn't miss it in the least. Thank you so much to the owners and to Steading for sharing this bit of paradise with your guests. It's the type of place that would be easy to want to keep a secret and not tell the rest of the world about. Your generosity in sharing it gives us mere mortals a bit of heaven on earth. I already share the Steading Holidays link with everyone I speak to about my holidays. I didn't! Deliberately! I tucked myself away, only going to the local shop for provisions. It's well stocked with friendly owners - and it was all that I needed. A fantastic location. Loved it. We loved staying at Rubh Dubh. Scenery spectacular and getting visited by the wildlife a lot, our stay here was just a joy. The cottage is well thought out and has the majority of items you would need to live there comfortably. Loved our stay and hope to be back. Fantastic scenery, plentiful wildlife and a simple but very well organised space. We would love to visit again. Arrived slightly stressed having driven down the single track roads from the Corran Ferry. I would get the Ferry to Mull from Oban and forward, rather than do the roads next time. It is a bit of a struggle getting stuff to the cottage, but a couple of big rucksacks full of everything would solve that I think. Rudh Dubh was all I expected and more.Fantastic location,clean and welcoming, fantastic level of equipment and things you may need. Being able to lie in bed and watch the Seals playing in the bay was a unique experience! Just being able to sit outside on the decking (wrapped up in a blanket!) watching the horizon and the snow on the far hills, washes all your cares away.The Pine Martin came every night, he isn't at all shy! We brought some wood with us, thank goodness, as the local shop said they had sold all their logs to one customer and wouldn't have any until the next week. Although we survived for a couple of days on the wood that had been left for us. (Thanks for that, it helped a lot.) We even went over to the Co-op on Mull, but guess what? they had sold out too! The Museum on Mull, just by the ferry is really worth a look, it's free, very small and full of interesting stuff. Rudh Dubh its been lovely, we were sad to leave, but hope to return. The Community Center is very good. Rudh Dubh is beautiful and peaceful and a wonderful place from which to explore west Ardnamurchan. It’s the cosiest cottage imaginable, and a place where you can properly slow down and enjoy the beauty of the locale. It does require sure-footed ness to get there, and a bit of planning if you’re staying more than a week, but it’s really worth it. While there buy veg from the outstanding local community garden and visit the suppliers market in Kilchoan community centre and support the local enterprises! 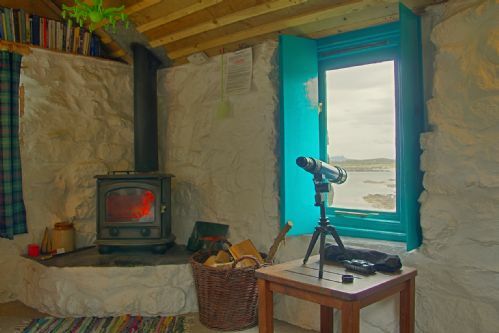 Rudh Dubh, for its size, is imaginatively furnished and equipped - binoculars, maps, walking guides are real bonuses - and the shower is stunning (shells, pebbles ...) The sofa bed works well and is comfortable in both functions. The fridge is an adequate size but lacks a freezer compartment. We also found the lack of a microwave a disadvantage as all food has to be carried in on the energetic, rocky, muddy and slippery cliff path. Once arrived however the location and view is stunning and we enjoyed swimming off the 'private' beach and at Sanna. Anyone going does need to heed all the warnings in the preliminary information - walking boots are essential and you need to be reasonably fit. The path system from Portuairk to Sanna via Rudh Dubh is overused and in places very muddy / boggy. Once parked on arrival, our car remained in Portuairk and we cycled to Kilchoan and the Lighthouse, and walked to Sanna. From Kilchoan we took the ferry to Tobermory for a 'mini-cruise' and enjoyed an excellent lunch at 'Cafe Fish' beside the ferry pier. This was our first time at Rudh Dubh: it ticked the boxes of what we were looking for and we enjoyed our week there. There is no shop in Portuairk; Rudh Dubh's facilities are its location, beach and scenery. Lots of brambles at this time of year! The cafe at the Lighthouse is excellent; we had lovely cake and coffee and bought gifts to take home. Rudh Dubh is a unique and special little place. Well appointed and cleverly adapted to provide a cosy and comfortable stay this little gem offers probably the most stunning outlook from any holiday cottage anywhere ! If you don't mind a short scramble round some rocks with your bags then you will be rewarded with a sense of seclusion and breathtakingly beautiful views. The footpath to Sanna Bay does pass right behind the bothy but even at the height of the season this does not interfere with the peace and tranquility this place offers and is simply other people enjoying this wonderful part of Scotland. Low tech and friendly. More than adequate for our needs ! A charming cottage that took our breath away. One week in the cottage without TV, internet or phone signal was absolute bliss. I have not felt so relaxed for many years. The location was stunning and the cottage itself was the totally charming. After reading log entries from other guests we felt part of small community who were fortunate enough to share this magical experience. This holiday was very special and I don't think that my wife and I have smiled so much in a vert long time. We will certainly return (very soon I hope). We have recommended this cottage to everyone that we have spoken to. Not many local facilities but the curry delivery service from Sanna Bay was fantastic. We loved everything about Rudh Dubh; the property is absolutely charming and very comfortable as well as extremely well-equipped. The location is second to none, with stunning views from the windows and a sun deck to enjoy the fine weather. I had expected that it would be a bit basic, but in fact it's luxurious, even the sofa bed is really comfortable. As described, there's no mobile signal which we would consider a plus, and it does feel wonderfully peaceful and isolated. It's true that a small number of people pass by the rear of the cottage on the footpath to Sanna, but we thought that was fine and enjoyed a few conversations, mainly about how lucky we were to be staying at Rudh Dubh. The walking is great right from the door, we hardly used the car all week. Obviously facilities are minimal, the nearest shop and pub being along 5 miles of winding road, but we enjoyed a visit to the community centre in Kilchoan and crossed to Tobermory on the ferry. Regarding access to the property, it isn't far and there is now a footbridge across the tidal stream so no need to wade even if the tide is high, but it's true that the path to the cottage is quite steep and uneven and does need sensible footwear and reasonable agility to negotiate. All in all the property and the location could not be bettered, and we enjoyed a wonderful stay. We knew from the description that there are limited facilities. The Sonachan hotel appears to be closed, so the nearest shop/pub/community centre are in Kilchoan. The community garden also sells fresh vegetables. Absolutely charming loved the location and the cottage would love to go back. Wonderfully peaceful just the wildlife. It was a perfect week. Chopped wood, watched the sunset, walked over to Sanna, mooched about on the beaches. The bothy is perfect, small, uncomplicated and cosy with everything you need. I booked again as soon as I got home. As last time we had a wonderful stay at Rudh Dubh. Again the skyscapes and seascapes were inspiring and amazing. Local walks are great (as is the coffee at Ardnamurchan lighthouse). There were daily visits from the 2 playful seals (and the 1 'billy no mates' seal) and evening visits from a Pine Marten to the window cill (sometimes a large one and sometimes a smaller, possibly a female, one). They like peanuts on a digestive biscuit drizzled with honey! ... and an otter at a distance on the rocks off Sanna beach. Many thanks to John & Fiona. We hope all subsequent guests appreciate the RD experience. It is unfortunate that we won't be able to visit again as we have just taken on a black labrador puppy (Mabel) and there is a no-dog policy. I spent a week at Rudh Dubh at the start of April on my own. Due to the bothy's position, I did find it a bit of a mission getting my stuff and then bags of logs over the small river and rocky and muddy headland - although by the end of the week I was finding it easier - was a bit fitter by then! On some days the path next to the bothy had quite a few walkers passing by, and twice, a small child came and peered in the window while I was inside reading which was a little awkward! HOWEVER! Although I would have preferred a little more privacy, the payback for sharing this incredible corner of the world far outweighed the rare uncomfortable moments when others came a little too close. I thought the bothy itself was fantastically kitted out - the owners have thought of everything and it was a joy to stay there and make it my own for a few days. Very comfortable - I slept well every night. By mid week I could feel myself going native - bringing the logs over, chopping them up with the axe that is provided, filling the bird feeder and watching and listening to the chaffinches, greenfinches, goldfinches and co., putting banana out for the pine marten, who visited the windowsill 6 nights out of 7 - I was lucky enough to see it having its supper twice, the regular visits by seals coming in to the little bay and doing their daily stretching exercises, a buzzard flying overhead being mobbed by gulls... It was a high spring tide whilst I was there and, along with a stiff breeze, the waves were crashing on the rocks - very dramatic. Some stunning sunsets, and the ever changing views across to Muck, Eigg, Skye are just beautiful. The walking opportunities from the bothy are many and varied from white sandy beaches of Sanna to the more rugged hilly interior and further round the coast to the Ardnamurchan lighthouse. The Ferry Stores at Kilchoan is well stocked and sells logs and kindling... and petrol. unique little cottage, i knew the location so knew what to expect. It lived up to expectations in terms of view etc. Well set out with all the requirements for my holiday. would just say that one of the information sheets suggested keeping food in glass jars because of the rodents, it would therefore be helpful to provide some glass storage jars, not the sort of thing one takes on holiday or carries in over the rocks! Been looking forward to visit number 2 ever since first discovering this hideaway. The location can't fail to disappoint and the cottage was as we'd remembered. Lovely. It's been the wettest summer in Scotland for a long time, and the ground round the house is a bit of a swamp but that's no ones fault. I've got a bit of a phobia of slugs though, and they seem to seek shelter in the cottage as came across five monster sized ones during the week in the shower, loo and living room which kinda freaked me out. I never noticed them the last visit so I assume it's been the constant rain that's not helping. Apart from this, the cottage is amazing and I think the solitude in the evening with only the cracking of the fire and noise of the sea is never to be forgotten. The community centre is really nice for a coffee and Internet catch up. We had a wonderful week in Rudh Dubh. Such a charicteristic hous on an unique place! Rudh Dubh (Roo Doo) welcomed us from the moment we arrived and every day kept us feeling safe, sound, and cosy. 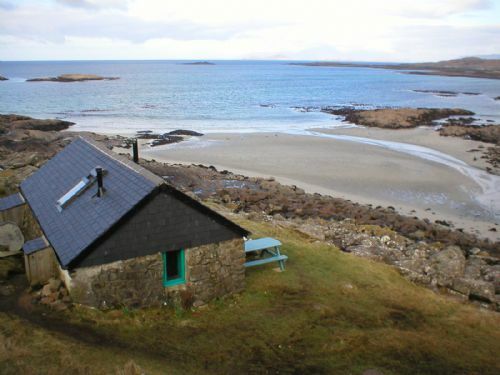 small but comfortable cottage on a dream location with a small beach at low tide and view on the rocks and the ocean, and in the other direction on the hills and sanna bay, with sheep around the house and seals in the bay below. Rudh Dubh is in a wonderful position, looking over the sea and with access to a little beach. However, for us, its position on a popular public footpath meant that it did not feel isolated or remote, which is how it is advertised and what we had expected. Although the footpath is mentioned on your site, we had been looking at the cottage website. There is nowhere in the space outside the cottage that is private, which was disappointing. For us, this was a deal-breaker and, although we had booked for 7 days, we left after 4. We didn't use any local facilities. We loved this place - it's tiny but beautiful, comfortable, well provisioned and in the most stunning location. It was the view out to sea that really sold it to us. It's not cheap for the size of the property but I'm sure you won't get any shortage of people wanting to come and stay there - we certainly hope to be back! One small point was that we found the stove a little difficult - we have one of our own at home so are very familiar with stoves in general - however, because there was no air being drawn in underneath the wood (+ the book says to leave the ash in for insulation), the draw was very poor sometimes. It seemed to be better when it was extremely windy outside.The ash pile was so thick at one point that the wood just sat in 1-2 inches of it and didn't burn very well. this is immersed in the wild, always close to the elements, remarkable light at midwinter, and such an indescribably inspiring view. only 5 or 6 metres from the water at high tide, and at low tide the beach is exposed. it looks across to Sanna, wonderful area to walk and take in the breath taking beauty. it's a challenging experience in winter. Beautiful place and a lovely cottage!! The cottage had all the necessary appliances (they were all in a very good condition). The views are beautiful and the local seals visit the bay (curious creatures!). We had a wonderful week at Rudh Dubh even though the otters and pine marten didn't turn up. Everyone else who had written in the visitor book seemed to have seen otters and we just missed tham at a bay near Ockle, as we discovered from the excited couple who had seen them (and scared them off). It was wonderful to be so close to the sea and to see it out of windows on two sides of the property. I even managed to swim in it but it was so cold that I just walked out into the bay and swam back a few times as I couldn't bear to just stay in and swim. Our only criticisms would be that the information didn't say that the walk to the cottage involved a rocky cliff path for part of the way, or that the footpath went right past the back of the cottage (a bit disconcerting if you were sat on the loo as walkers walked by chatting or calling their dogs). One women even sat at 'our' picnic table with her 3 dogs - it would be useful if it was more obvious which areas were part of the garden. Excellent especially the community garden - we ordered the veg bag and restocked mid-week, and the Sonachan Hotel. Ferry stores was also good and could be relied on to h ave almost anything we needed evn the chilli which I had forgotten to pack. A wonderful week in this unique modernised black house in Ardnamurchan. Beautiful location, comfortable cottage and warm dry weather. Daily visit from pine martin and occasional sitings of otter and seals. Fantastic location and position, the best in Scotland. Close-up sightings of Great Northern Divers, PineMarten, Otter and the usual seals - all within 100 yards. This place certainly lived up to expectations. I've come away with the sounds of the sea in my ears, who needs a tv when the view from your window is constantly changing? My first time here, and can't wait to go back for another dose of relaxation. This was our second stay at Rudh Dubh and it was just as lovely as we remembered. The best things about this place? Well, it's 4 miles to a mobile phone signal, there's no TV, and the two 'private' beaches and scenery are absolutely breathtaking. On one of our clearer days we could see South Uist - a good 50 miles away! The wildlife is also highly entertaining, with Mr Seal in the bay and a pine marten eating peanut butter off the windowsill. It feel utterly secluded but the car is only a 5 minute hike away (or half-an-hour if you include a beach frolic). If we had to pick a fault, it would be that both the oven and fridge are a bit worn and we are very glad we took our own axe! But, apart from that - everything was adequate and comfortable. After all, we are not looking at 5-star luxury accommodation here - what makes Rudh Dubh perfect are the views, the light, the sky and the stars. My sister in law and I stayed at Rudh Dubh in mid July. What a magical place! Wonderful for hiking ,relaxing, being on the beach . The first morning we woke to sheep outside the window. I wonder if they thought we were there to feed them or, maybe they were telling us to move along, we were on their turf! A critter also set to knawing at the roof in the early hours of the morning. One poke on the ceiling with a broom handle usually silenced things. Pretty benign "wildlife". We had some wonderful BBQ's and warm cosy fires at night. Truly a beautiful part of the world. I wish we could have stayed longer, maybe next time. PS not a big fan of single track roads while driving vauxall standard. I would not recommend this car to anyone who is thinking of renting a car and driving single track. We also took the ferry from Kilchoan to Tobemory and then to Oban on the way to Edinburgh. It was a nice way to avoid a lot of single track we'd already experienced and gave us a chance to see some of Mull and Oban. Cheers from Canada!